On June 7, the East African Court of Justice will hear a case brought by four Maasai villages against the Tanzanian government for its responsibility in the August 2017 burning of homes, which left tens of thousands of Maasai homeless and livestock displaced. In advance of the hearing, the government and police have intensified pressure on local people with dozens of arbitrary arrests, intimidation, and threats to Maasai villagers. Local villagers are calling for international attention to their situation in the hopes that it will force the government to cease its abuses and allow the legal case to move forward. The burning of homes, violent evictions, and other human rights abuses were detailed in the May 2018 report Losing the Serengeti, which has created widespread awareness and outrage about the plight of the Maasai in Tanzania. The Tanzanian government responded to the report with denial and threats against any people or organizations that supported its release. Today, the Oakland Institute sent an open letter to President Magufuli regarding these responses, demonstrating the government’s long-standing discrimination against the Maasai and indigenous groups more broadly in Tanzania. 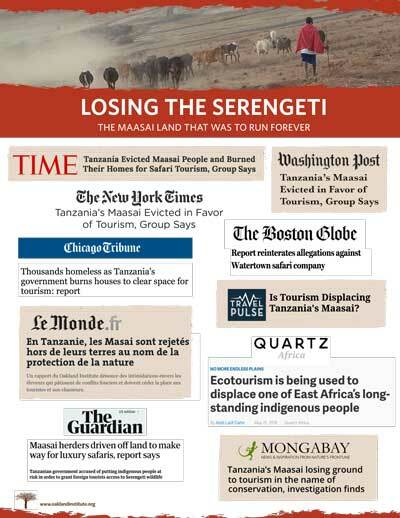 OAKLAND, CA, June 6, 2018—Last month, the Oakland Institute released Losing the Serengeti: The Maasai Land that was to Run Forever, which revealed how Tanzania’s Maasai face appalling levels of human rights abuses in the name of conservation and the promotion of safari tourism in the Ngorongoro and Loliondo regions. Tanzanian government officials responded with an official press release, messages on social media, and increasing repression and intimidation on the ground. In recent days, the government has taken steps to undermine the ability of four villages—Ololosokwan, Kirtalo, Oloirien, and Arash—from taking their case regarding the violent August 2017 evictions to the East African Court of Justice. The court will hear the case on June 7, but in advance of the hearing the government and police have intensified pressure to derail the case in the regional court. On May 31, lawyers representing the Maasai villagers wrote an urgent letter to the East African Court of Justice seeking support to stop the police from harassing, intimidating, and arresting the plaintiffs. unfounded and false allegations that these individuals were involved in the production of our report. This is the latest in a long string of reactions by the Tanzanian government to the plight of Maasai. In recent weeks, rather than address the serious issues raised by the Oakland Institute’s report and the very real concerns of Loliondo’s Maasai, the government has chosen to recklessly lash out and threaten local individuals and organizations. Minister of Natural Resources and Tourism, Mr. Hamisi Kigwangalla, denounced the Oakland Institute’s work as a “fake report” and stated that one “can’t teach us how to handle our internal affairs. 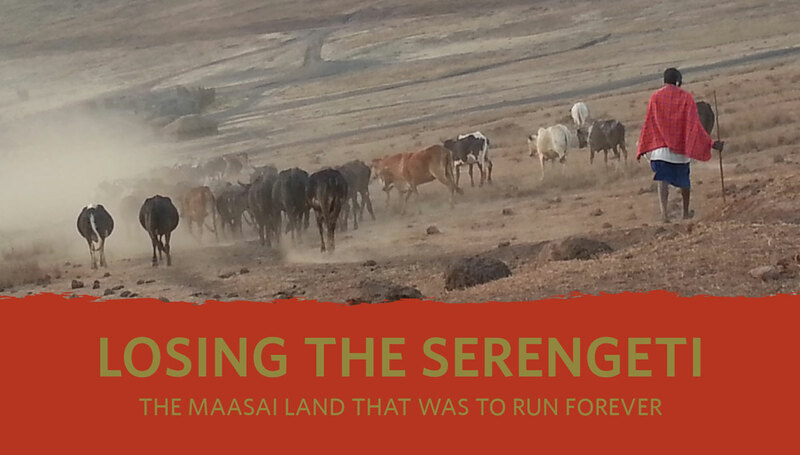 The land is ours, the Maasai people are ours, the wildlife is ours and everything.” He further suggested that the report was meant to “tribalize” this issue—illustrating a long-standing position of the government that the Maasai are not indigenous. Minister Kigwangalla also stated, “We are looking into the matter very closely and soon as we find who sponsored and participated in producing that report will face the law.” Special investigations and raids were carried out in the days following the release of the report in order to identify individuals or organizations who could have provided assistance or information to the researchers. As a result, the extreme climate of fear that is described in the report is seriously worsening. “The Oakland Institute calls on the Tanzanian government to immediately cease threatening its own citizens in relation to our work,” said Anuradha Mittal, Executive Director of the Oakland Institute. “We likewise call on the government to immediately cease the intimidation and harassment of all Maasai, especially those who are seeking justice at the East African Court of Justice, which is their last resort given that Tanzania’s justice system has failed them on numerous occasions,” she continued. 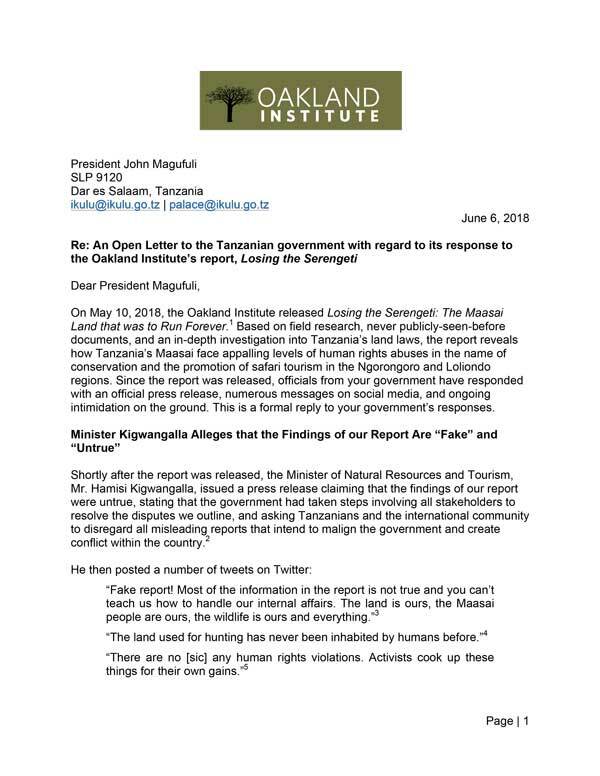 Today, alongside this press release, the Institute sent an open letter to President Magufuli and the Tanzanian government regarding its responses to Losing the Serengeti calling for justice and scrutiny to the appalling situation on the ground.